Garda Aidan Flanagan was kicked in the back while arresting a youth for burglary. 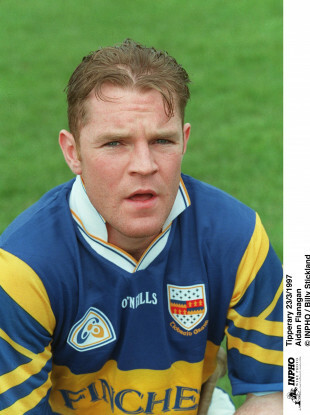 A GARDA AND former captain of the Tipperary County Hurling team has been awarded €195,000 damages in the High Court in part compensation for what was described as devastating injuries he suffered when kicked in the back after making an arrest. Mr Justice Bernard Barton said in a judgment on a compensation claim by 43-year-old Garda Aidan Flanagan that the ferocity of the blow he had received to the base of his back had devastating consequences for him. Micheal O Scanaill, SC, who appeared with barrister Rebecca Graydon for the Minister for Finance, told the court that a payment of €125,000 had already been made to Garda Flanagan pending judgment. Judge Barton said he would review the outcome of negotiations between O Scanaill and Alan Keating, counsel for Garda Flanagan, in relation to compensation for loss of future earnings. He said Garda Flanagan, who had suffered the injury when he was only 30 years of age, had made a substantial €1.47 million for general damages and recurring pecuniary losses. The judge said Garda Flanagan, of Middleton, Co Cork, in August 2005, had arrested a youth following a store burglary in which alcohol had been stolen. The youth had consumed a bottle of vodka and a quantity of e tablets just prior to his arrest. When entering the back seat of a garda squad car to restrain the handcuffed teenager the youth had directed a kick into the small of Garda Flanagan’s back. Judge Barton said that over the years there had been a most serious and significant deterioration in Garda Flanagan’s physical and mental capacity as a result of ongoing chronic pain that he had felt he could no longer serve as a garda and had applied, unsuccessfully, to be retired on health grounds. Judge Barton said that Garda Flanagan had grown up in Cashel, Co Tipperary, and had set out, following studies in University College Galway, to carve out a career for himself in the Garda Siochana in which he also had a serving brother and sister. He was a fit young man who had a passion for hurling, a sport in which he had excelled to the extent that he had played for Tipperary and had won an all-Ireland medal at Under 21 level before having been elevated to the senior panel and hurling for his county of which he was immensely proud. The judge said Garda Flanagan who, because of his injuries eventually faced financial embarrassment to the extent of attempts being made to re-possess his home and having to be treated in St John of Gods in Dublin, had also excelled at golf and acquired a handicap of nine. As a result of chronic pain and a perceived inability to do his work properly he had developed psychological difficulties but had fought against being labelled as someone with a mental illness. He had on a number of occasions throughout extensive medical and psychological treatment sought to be allowed to retire on health grounds. Judge Barton said one of the issues before the court was the fact that Garda Flanagan had, prior to the 2005 assault, suffered back injuries in a car accident and in a slip and fall. He had claimed that his back injuries, from which he had initially recovered and returned to full-time duty, had been seriously exacerbated by the kick he had received in the patrol car. The judge said that in the absence of the assault he would have continued to suffer recurring low-grade back pain and this was one of the issues to be taken into consideration by the court in assessing compensation for the consequences of the 2005 assault. He said the degree of force used by his assailant and the nature of the damage caused by the kick had been controversial during a 15-day hearing of the case. Judge Barton said Garda Flanagan had been out of work for progressively longer periods of time and was so convinced he would be unable to continue as a policeman that he had taken a part-time business course to prepare himself for an eventual new career in order to maintain his wife and family. Meanwhile doctors had differed considerably on the causation of Garda Flanagan’s condition and the contributory factor of his previous accidents. By 2010, he had considered retirement as imminent as he had reached the stage of falling asleep on the job due to the amount of medication he was forced to take to ease his pain. On the day he had left work because of the way he felt he knew his career in the Garda Siochana was over. He was later diagnosed with untreatable chronic insomnia. Judge Barton said Garda Flanagan’s pay was reduced due to his absences from work and his lack of funds had been reduced to such an extent as to be unable to purchase the medication he required on a daily basis. Making his award of €175,000 for pain and suffering in the past and into the future and €45,000 for loss of past earnings, Judge Barton said he accepted the evidence of Garda Flanagan and his wife, Siobhan, who both felt his condition was likely to improve with the conclusion of the long drawn out legal proceedings. He adjourned the issue of the outcome of inter-party talks in relation to overall loss of earnings in the future until mid-April. O Scanaill said that while Garda Flanagan was still a member of the force he was on what was known as temporary rehabilitation pay. Email “Garda and former Tipp hurling captain awarded €195k for suffering 'devastating injuries' on duty”. Feedback on “Garda and former Tipp hurling captain awarded €195k for suffering 'devastating injuries' on duty”.